Background: Amphotericin B, designated as the gold standard among antifungal drugs is the only fungicidal effective against systemic fungal infections. But this drug has various pitfalls associated with it, to bypass which various techniques have been employed and resulted in a variety of lipid based commercially available formulations, which demolished only few of the shortcomings associated with this drug. Further, improvement in the delivery systems of Amphotericin B is advancing at increasingly frenetic pace, to surmount its research and to exploit its therapeutic potency with least toxicities. Method: The patent search on “Amphotericin B for its safe and effective delivery” has been carried out to present assimilated information on the patents of the universally accepted Amphotericin B formulations and technologies. Also, the area of focus was the physicochemical properties of Amphotericin B, their role in formulation development and also nanotechnology based formulations of Amphotericin B. Results: Amphotericin B possesses poor aqueous solubility and systemic toxicity rendering obstacle in its formulation development. The interest of scientists and pharmaceutical industries to make further investments in the development of Amphotericin B formulations is due to rare occurrence of resistance to this drug. To bypass these drawbacks, various techniques have been patented which resulted in a variety of commercially available formulations to overcome the limitations of high cost, limited availability, poor storage stability and poor patient compliance. In lieu to this, scientists have developed and patented many novel drug delivery system based formulations and technologies such as use of novel carriers, modification in process for production and purification of Amphotericin B, formation of salts and complexes etc. to bring in limelight the benefits of this wonder drug. Conclusion: The purpose of the article is to present assimilated information regarding patents on Amphotericin B formulations and technologies. Keywords: Amphotericin B, antifungal activity, lipid-complexes, nanotechnology, NDDS, purification processes. Keywords:Amphotericin B, antifungal activity, lipid-complexes, nanotechnology, NDDS, purification processes. Abstract:Background: Amphotericin B, designated as the gold standard among antifungal drugs is the only fungicidal effective against systemic fungal infections. But this drug has various pitfalls associated with it, to bypass which various techniques have been employed and resulted in a variety of lipid based commercially available formulations, which demolished only few of the shortcomings associated with this drug. 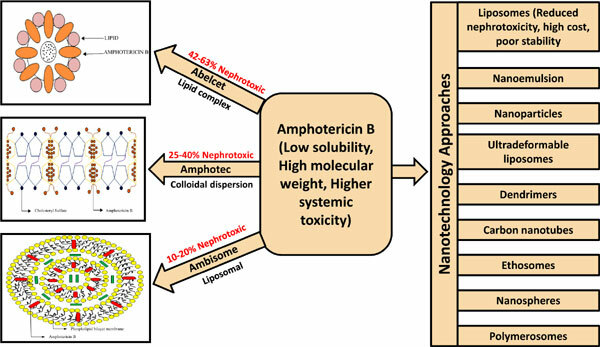 Further, improvement in the delivery systems of Amphotericin B is advancing at increasingly frenetic pace, to surmount its research and to exploit its therapeutic potency with least toxicities.